I welcomed myself to the 87th annual San Gennaro festival with a large warm marinara slice. As I walked through Mulberry street I was amazed with the depth of the non-food vendors present this year. Chinese men and women selling Buddha figurines with silk prints right alongside African jewelers and veteran NYC t-shirts vendors. Amazing. I bought a ‘nice’ godfather tshirt, a pair of shades and moved onto the fresh lemonade lady, eager to squeeze out a soothingly sweet lemon for my cold beverage. Tangy! 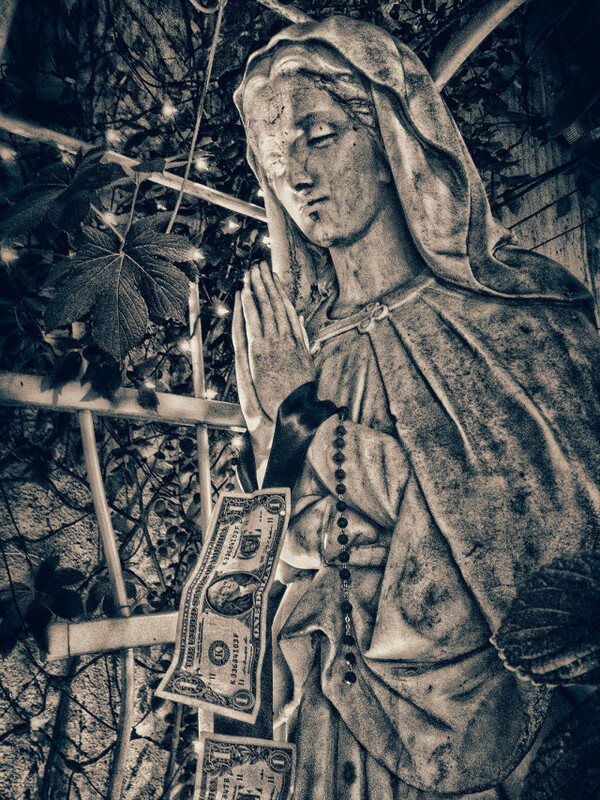 This year, the patron saint of Naples blessed the street fair with many hard working sausage extraordinaire’s. I’ve never watched these guys with a keen observant eye, so I decided to check out some of their famed skills. I made my way through the carnies – won a goldfish – and diligently looked out for a grill master and stood there and carefully noted his loving surgeon like handling of those large monstrous sausage rolls. The grill was sizzling at this point and it scared me whenever he diverted himself to grab some fries or fried chicken for another hungry customer. Why wasn’t he worried about that grill burning those wondrous cellulose encased trifectas of delicious meatiness? I decided to question him. Mistake – he gave me a quick shrug and a nonchalant dismissive grin. I’m sure if I looked deep into his eyes he would’ve been burned a hole in my already shaken confidence. So I waited and watched him shuffle the meat around the grill. Then he flipped it, carefully, just long enough for my eyes. Now I don’t believe that it’s right to give away trade secrets, but if something is going to benefit all mankind then it deserves to be known to the masses. Ok, are you ready for this? 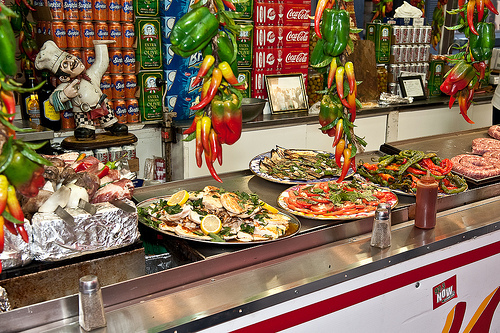 Those ginormous sausages are actually cooked on top of a layer of onions and peppers! Giving them the tender sweetness of the peppers and keeping them at the perfect temperature for that perfect snap as you bite into a sausage and pepper hoagie. So there you go folks you don’t ask a professional why he does what he does. Especially when the line is a staggeringly deep into an overpopulated nyc street filled with who knows how many mafioso’s. P.S. 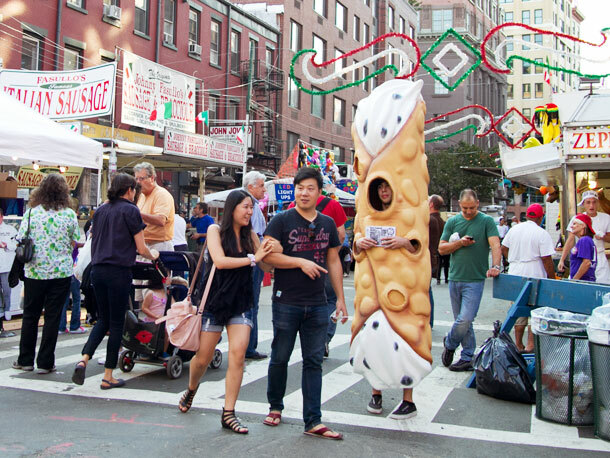 Next year im going to figure out, just how they make those gigantic cannoli’s and also just how fresh are those fried crab and lobster fingers? Stay tuned.